Day 90 - Hong Kong. Buddha in the Mist! Day 90 Hong Kong, Buddha in the Mist! We awoke for our first full day of adventure in Hong Kong. We had a few things we wanted to see and do in Hong Kong with the boys that Steve and I enjoyed when we were here two years ago. 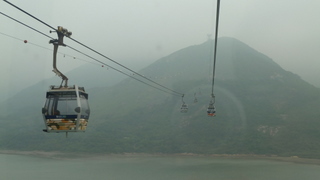 One of those was the cable car ride to see the Big Buddha. The weather was not the best but we wanted to do the excursion before it got crazily busy since the 10th May is Buddha’s birthday and the crowds would get thicker and thicker heading to the site. Before we could visit Buddha, we first had to go via the travel agent recommended by a friend and drop off our passports to finally organise a Chinese visa. We also walked away witha mud map for the rest of the month, our last month in Asia. Our upcoming plans include flying to Taipei, Shanghai, Xian and then Beijing. Lucky we went prepared with jam sandwiches, carrots and museli bars because the boys ate their way through the time we spent in the travel agency! With that job Well, off to the Buddha we headed. A walk, a train, another walk and then the cable car ride. There was no-one there compared to two years ago when we lined up for nearly 2 hours! This time we walked straight in and within 5 minutes we were sitting in a ’Crystal Cabin’ – a cable car carriage with a clear floor! Enjoying the view from the crystal cabin - whilst we had it! We could see that our view was going to disappear as the mist loomed! 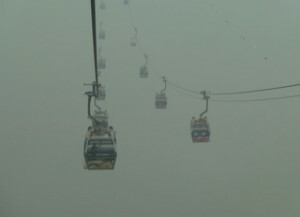 The cloud became so thick that eventually you couldn't see an approaching cable car until it was right beside you. In the two years since we were last at the Big Buddha, the site has become even more commercialised with gift shops, food outlets including Starbucks and Subway and souvenirs galore. When we arrived at the top of the cable car ride we were greeted by an employee presenting us with the wonderful package of keyrings, photo and snowglobe with the photo of us sitting in the cable car! It was a nice photo but why would anyone want a snowglobe with a photo of themselves on the Ngong Ping 360 cable car in it – there must be a market since they sell them. Ridiculous. So we left the shop area and walked to find Buddha in the Mist. The boys and Buddha - can you see him? Well, it doesn’t take long to see a Big Buddha so we headed over to the monastery because I really wanted the boys to see the big sticks of incense that they burn that are about 20cm thick and 1 metre tall. They didn’t have any that size that were burning unfortunately but we were in the right place to catch a free show that had only just begun and did not appear on the schedule of events we had. What a bit of luck – the show was amazing and we got the best seats in the house; just beside the stage at the back and in the shade. 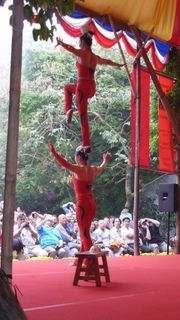 We turned up just in time to see the acrobatic girls performing their stunts. 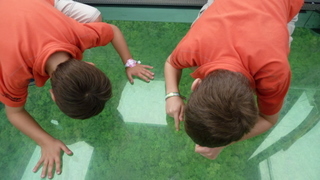 This was followed by the martial arts monks – holy mackeral they were so cool and the boys have never sat so still! The security guard didn’t mind the boys sitting on the bench behind the security tape … but he did move us when the martial arts guys performed an act where one guy hit the other guy with a wooden dowel one metre long. When he hit him, the wooden dowel shattered and flew threw the air in pieces! The next guy got hit with a piece of metal, over his head and it broke into pieces! Anyone of us would have been a bleeding mess and headed to hospital!! Truly amazing. This is just one of their amazing stunts. We had a totally different Big Buddha experience to the one we had without children two years ago – less crowd, more mist, less heat but just as enjoyable and it really is still a worthy outing. On the way back to the cable car we found one of the shops was filled with toy machine selling Gacha balls. 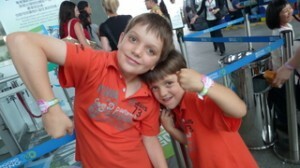 The boys had fun choosing a toy each for $5 HK each (about 75 cents Australian). The last cable car leaves at 6pm. As it was 5 pm we thought we’d better get a move on. We just beat the crowd and got our ride back to Tung Chung and the Citygate Outlet mall. There is a Food Republic food court there so we headed there for dinner. 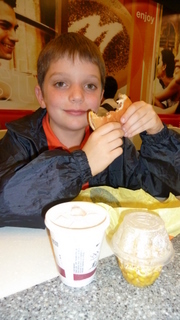 There was so much choice and we walked around aimlessly to start with before deciding that maybe the boys would enjoy their first McDonald’s in a very long time and we could enjoy ‘our’ food later. 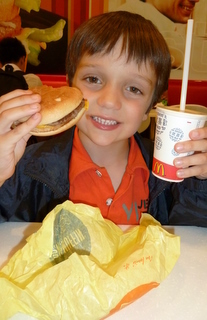 So this is what we did … not everyday you get a Happy Meal with a cup of corn instead as an alternative to fries. Steve and I ate teppanyaki later. 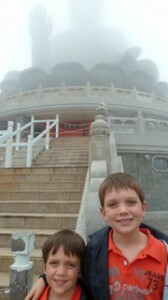 That was our big day out at the Big Buddha and first day out in Hong Kong with kids.